MunaTo Festival presents the MunaTo Yesterland Themepark! 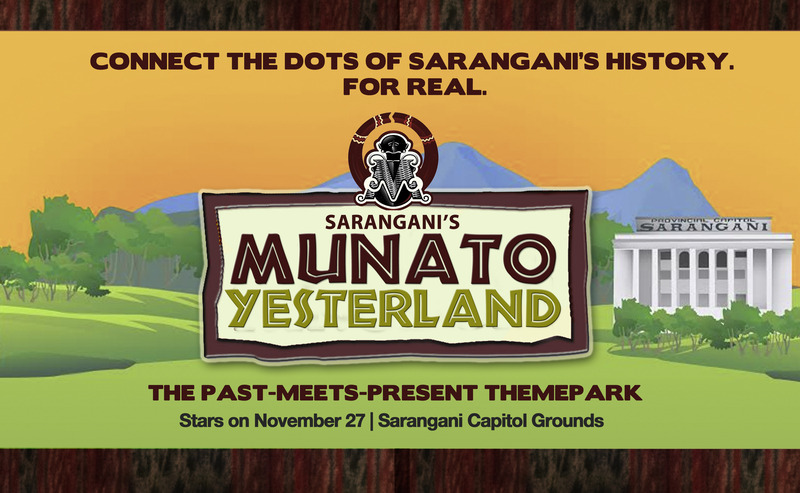 Sarangani Province for the first time is turning its Capitol Grounds into an Educational Themepark. On November 27-29, 2014 Sarangani is going to bring forth 12 Attractions that will make learning about history, social science, arts and culture in a more interactive and fun way! MunaTo means “First People” in the Blaan Language. Although Sarangani is a young province, having been crafted out of South Cotabato in 1992, it has a long history. The anthropomorphic jars found in Maitum takes our Philippine history all the way back to the Metal age. 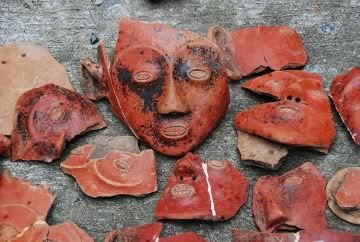 According to the carbon dating of the pottery found, it is possible that civilization existed as early as 500 BC in Maitum. Many scholars are now looking into the possibility that this group of people are much earlier than the Malay race influence on the Philippines. Because of these archeological finds, Sarangani claims that the First People are found in this area. It was in 2002 that the Sarangani Tourism Council and the Provincial Government decided to celebrate their first MunaTo Festival. The Festival featured the diversity of Sarangani’s people, culture, and treasures. This 2014, the 12th MunaTo Festival and the 22nd Founding Anniversary of Sarangani is taking a new twist on featuring the rich diversity and heritage of this People. Cave of the Ancient – This is a light and sound show regarding the anthropomorphic jars found in the caves of Maitum, Sarangani. Tribal Village – This will showcase the Tboli, Blaan, and Tagakaolo tribes. There will be a show every hour about their music, dances, chants and stories. Also found here are products for sale made by the Indigenous peoples of Sarangani. Sarangani Wildlife Museum – This is found at the ECPC. The museum features the different animals and species found in Sarangani that are preserved for study. Also at the 2nd floor auditorium will play Sarangani- made films from last year’s Salamindanaw’s entry. Looms & Beads – Located at the Kasfala Hall, the Looms and Beads is an extensive, elaborate, and detailed exhibit featuring traditional arts and crafts in Mabal Tabih, Saul (bead works), and other artifacts. This is an exhibit of Heirloom designs and fabrics from our Indigenous Tribes in Sarangani. MunaTo Fotoloco – This is the sculpture of Kublai found at the Sarangani Capitol depicting the first people. Here people can take their wacky and fun photos. A photobooth will be available to take photos for a fee! Sarangani Street Arts – On the back street of the Capitol, several Sarangani artists will create a 3D street art of the different Sarangani tourist destination for those with tickets to take their chance for photo ops. Glan 100 – Since Glan, Sarangani is celebrating their 100th year this 2014, MunaTo Festival is giving a tribute the first settlers of Glan. We invite you to also try to be one of the Colonos! Sarangani Historical Lane – Sarangani gives tribute to all the leaders that have served Sarangani Province since its creation since 1992. Moro Cottages – The different tribes and Moro themed cottages will be on display with hourly cultural dance show. Here you will learn about the traditional practices for marriage, for childbirth, and the others. The Moro themed cottages will be a people’s choice competition. People gets to post a sticker vote for their favorite cottage! Fabli Guni & Farmers Market – This will be the biggest gathering of Sarangani Produce and Products. Included here will be Organic Vegetables, Fruits, Sarangani Upland Rice varieties including ornamental plants, and potteries. Also for sale, will be Sarangani’s processed foods, Aquaculture harvests, handicraft and furniture, fashion, and even Halal foods. This is one full market where you can buy and even deal with suppliers! MunaTo Arcade – This is the section for food and novelty items. Here traders sell snacks, meals, drinks, and other goods. MunaTo Center Stage – Found at the center grounds of Sarangani Capitol. Here free shows and activities that will be viewed by all Themepark goers. This includes the daily parade and mascot appearances, the tribal sports and boxing competitions, magic shows, concerts and Pearl of Sarangani. 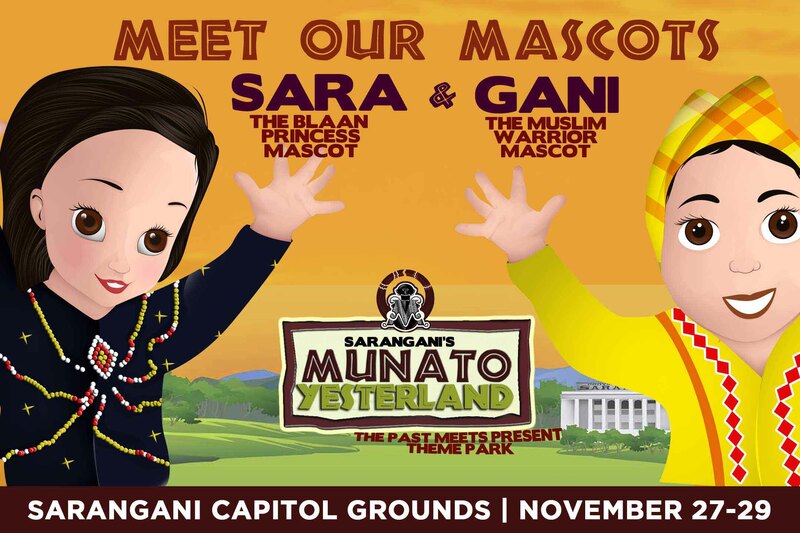 Also the other highlight feature that the kids will surely love will be the mascots Sara, the Blaan Princess and Gani, the Muslim Warrior. These two mascots will have appearances around the park throughout the 3-day event. The Munato Yesterland themepark aims to bring studying of history, social studies, science and culture and arts in a very fun and interactive way! To enter the MunaTo Yesterland Themepark is free. However to enter each attraction a rate of P10.00 will be charged per person. Better yet people are encouraged to avail of the One-Day Unlimited Pass at Php50.00 to enter ALL attractions. If you are a Senior Citizen, Sarangani resident, Sarangani student, or Sarangani employee, you can avail of the discounted One Day Unlimited pass at Php30.00. Present your ID at the Ticket booth. This has been the most exciting twist just yet! So book and buy your tickets right away. Call STIPC at (083)5085230 or GO SARANGANI TRAVEL at (083) 5528015 for more information! Previous PostSWEET NOVEMBER SALE!! !Next PostCHRISTMAS AT THE 12TH PARADISE – GREAT DEALS!